Thank you so much for your support for my fundraising campaign last month! I know everyone has many, many good causes competing for their attention and funds so I really appreciate your devoting some of yours to mine. Children should be playing and learning, not working! Your donations will provide more than 25 migrant farmworker children with school supplies, educational materials, and the hygiene items they need in their tent homes. Overall, 324 children will be assisted by Hayata Destek's fundraising campaign! 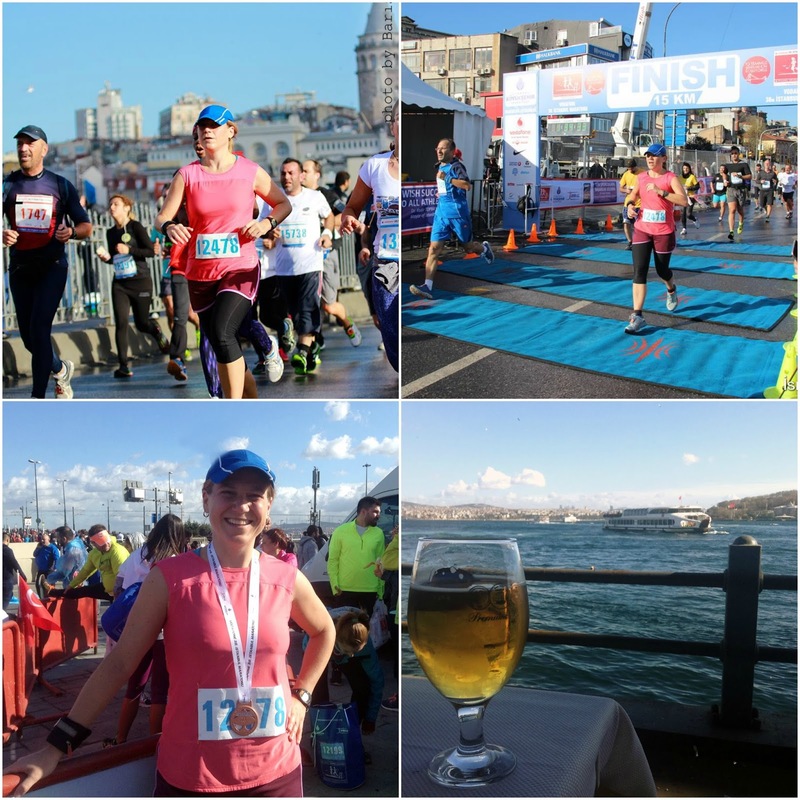 In a country where neither running nor individual charitable giving are common pursuits, I'm also proud to be among nearly 5,000 runners who raised more than 6.7 million Turkish Lira for 29 worthy NGOs by running the 10k, 15k, or full 42k race in the Istanbul Marathon and fundraising through the wonderful organization Adım Adım ('Step by Step'). off my finisher's medal, and enjoying a post-race beer. Last but not least, I had a fantastic race too :) It was my fourth time running the 15k in Istanbul, and I smashed my previous personal best by nearly seven minutes, completing the course in 1:32:58 (one hour, 32 minutes and 58 seconds). Despite rain overnight and a tumultuous sky in the early morning, we ended up with a gorgeous day for running. After finishing my 15k, I met up with runner friends to cheer on the marathoners at the finish line and then enjoy a couple of well-deserved beers by the water. This year, I've overcome my intimidation about running with other people thanks to an excellent small group of runner pals who challenge and encourage me on early Sunday morning trail runs in and around the Belgrad Forest north of the city. I know pushing myself with them was a big factor in my success at the race — as was knowing you were all cheering me on from near and far! I encourage you all to learn more about the excellent work of Hayata Destek and their ongoing efforts to combat child labor in Turkey and help provide relief aid and psycho-social support to some of the more than 3 million refugees now in this country. You can read more about them in English at http://www.hayatadestek.org/en/ and follow along (mostly in Turkish, but also with photos!) at https://www.facebook.com/HayataDestek/?fref=ts.